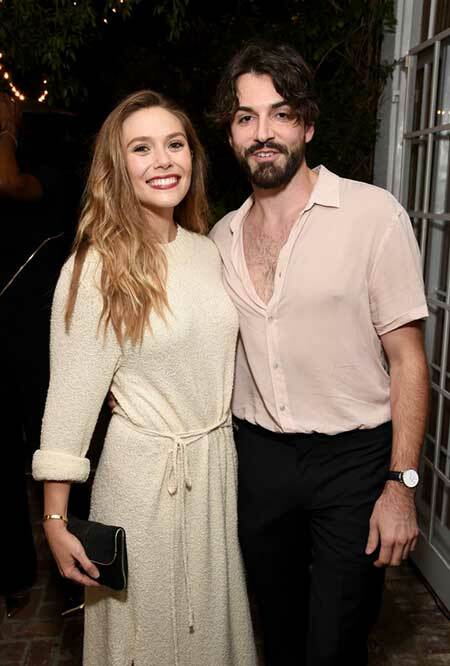 Is Elizabeth Olsen Lesbian ? An American actress who rise to prominence after she starred in horror film actress in Mary Martha May Marlene and Silent House. She is daughter to Jarnette "Jarnie" and David "Dave" Olsen. She is sister of famous actress and twins Mary-Kate and Ashley Olsen. When she was young she took ballet and singing lessons. She attended New York University's Tisch School of the Arts and the Atlantic Theater Company where she learned acting. She has starred in blockbuster movies like Avengers: Age of Ultron (2015), Liberal Arts (2012), Godzilla (2014) etc. for which she has won awards like Best Leading Actress and Most Promising Performer. Elizabeth Olsen was born on 16 February 1989 in Sherman Oaks, California to Jarnette "Jarnie" and David "Dave" Olsen. Her father worked as a real estate developer and her mother was a personal manager. She belongs to English and Norwegian ancestry. She is the sister of twins Mary-Kate Olsen and Ashley Olsen. Also, she has an elder brother, Trent and two half-siblings. As a child, she received singing and ballet lessons and began acting at a young age. She performed in How the West Was Fun and The Adventures of Mary-Kate & Ashley. She studied at Campbell Hall School in North Hollywood from kindergarten to grade 12. After completing graduation, she joined New York University's Tisch School of the Arts. In addition, she attended the Moscow Art Theatre and spent a semester over there. Olsen began acting when she was just four year of age. She co-starred in Mary-Kate and Ashley's productions when she was six. She also gave auditions for the movie Spy Kids. She almost gave up an acting career when she was all time surrounded by media due to Mary-Kate's eating disorder. She received wide recognition playing in the movie Martha Marcy May Marlene in 2011 alongside John Hawkes, Sarah Paulson, and Hugh Dancy. Meanwhile, she worked in many other projects including Silent House, Red Lights, and Liberal Art. She performed in a 2013 movie Very Good Girls with Dakota Fanning. Some of her recent projects include Captain America: Civil War, Ingrid Goes West, Wind River, Kodachrome, and Avengers: Infinity War. Olsen has received a number of awards for her role in Martha Marcy May Marlene associated with Florida Film Critics, Ghent International Film Festival, Vancouver Film Critics, Chicago Film Critics Association and Los Angeles Film Critics Association. In 2013, she won Fangoria Chainsaw Awards in Best Leading Actress for Silent House. She grabbed Hollywood Rising Star Award in Deauville American Film Festival for I Saw the Light. Olsen has an estimated net worth of about $5 million at present. She made a good fortune from her career as an actress. Olsen was in a relationship with actor Boyd Holbrook in 2013. The couple got engaged in 2014 but broke up after a year being together. She is currently dating musician and Milo Green band member Robbie Arnett in March 2017. They were first rumored to be dating when they were spotted strolling arm in arm in New York City in March. The duo made their first public appearance as a couple while attending the 2017 Gersh pre-Emmys party together in Los Angeles. It's clear that the pair have happily crossed a year being together. They are still going so strong in their relationship. Happy Birthday. I love you very much. So I’m telling instagram. Arnett frequently appears in Olsen's Instagram posts. Their relationship came into light after they were spotted together having fun in Olsen at the Vanity Fair 2012 Oscar Party. They dated for three years. They were even engaged but the relationship didn't lasted and they broke up calling off their engagement too. He is her co-star of movie Captain America: Civil War started back in April. It is said that they have been quietly dating after the filming. It is said that they were romantically linked after they were filming for upcoming movie musical I Saw the Light where they are starring as husband and wife.